Suzanne Martel’s 1963 The City Under Ground is the Anglophone version of Quatre Montréalais en l’an 3000, also published as Surréal 3000. The underground city of Surréal1 was founded by survivors of the Great Destruction, survivors who had escaped the disaster by taking refuge in a geothermally powered facility under Montreal’s Mount Royal. As far as the founders knew they were the only humans left on Earth. By the year 3000, no visitor from outside Surréal has appeared to contradict this belief. Indeed, so convinced are the inhabitants that the surface of Earth is still uninhabitable that nobody has checked conditions outside for centuries. A small earthquake changes everything. Luke P9 discovers that the tremor has opened a small passage to the surface of the Earth, one that bypasses the safeguards intended to protect the foolish from leaving the city. Inspired by tales of the Earth before the Great Destruction, moved by a strange, inexplicable compulsion, he ventures onto the surface. Rather than the lifeless wasteland he expects, he finds a vast green wilderness. He also encounters young Agatha, whose powers of telepathy bridge the language barrier. Agatha hails from nearby Laurania, another community that has survived the disaster. Technologically backward, ignorant of much of their history, the Lauranians nevertheless remember enough to eschew the violent, bad ways that led to the Great Destruction. Luke must work out how to inform the Great Council of his discoveries without admitting how he made them. Soon after the small quake there is another momentous development. The inexhaustible power supply that Surréal has depended on for centuries becomes unreliable. The issue does not seem to be with the generator itself, but with the power transmission system. A small child is sent into the narrow access tunnels to diagnose the problem. Bernard makes a discovery as remarkable as Luke’s. The power systems have not failed. Some agency is tapping into Surréal power lines. There is a second underground community near Surréal! And unlike Laurania, this second subterranean community has not abandoned violence…. Suzanne Martel was a prolific French-Canadian author. Since I cannot read French, I am dependent on translations. I suspect that in this case the translation is not a good one … as has too often been the case with spec-fic translations (Jules Verne in particular was subjected to dismal translations until the 1970s). 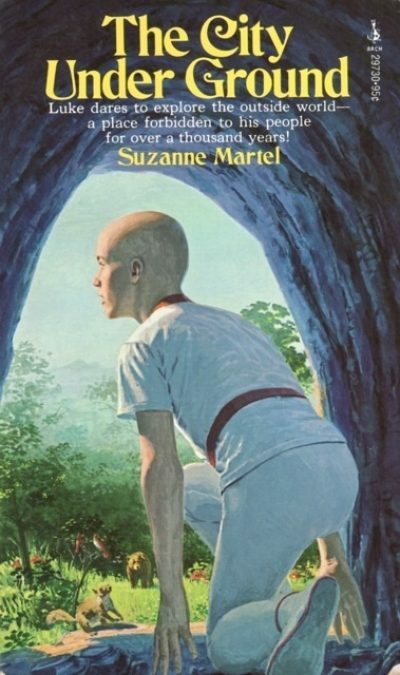 The fact that she was a Canadian author must been the main reason that her books were placed in schools across Canada, where millions of kids like me would have encountered them. As well as limping prose, the book also features a sketchily imagined stock future. The people underground live in a mid-century modern science city. They subsist on food pills, stay healthy with healing rays, and are continuously observed and regulated — ostensibly for their own good. They are bald (like so many highly advanced people). But the city is far from a full-blown dystopia. Life is fairly good if you don’t try to go outside (people caught trying to exit the city are consigned to insane asylums). Another oddity in the setting is that both Luke and Agatha’s communities know just what practices or technologies they have lost. Luke knows that his community no longer has a religion; Agatha’s father converses knowledgeably about his people’s total ignorance of science. It’s as if … these characters know what the author does! The mysterious strangers responsible for the electricity theft are cursorily sketched. Who they are and whence they came is never explained. Their motives are vague. Whether they are actively hostile, or are simply stealing because they can or must, is left to the reader’s imagination. The conflict never descends into violence, perhaps because Martel was never part of the SF mainstream. Had she been, there would have been at least one war between Surréal and Laurania on one side and the power-stealers on the other. Martel opts for a more optimistic (although somewhat anticlimactic) resolution. The City Under Ground seems to be out of print. Surréal 3000 is available here (Chapters-Indigo). 1: Originally “sous le Mont-Royal,” under Mount Royal. Over time that was shortened to Sous-Real (Under Royal) and then Surréal. Huh... I remember an excerpt from this in a grade-school reader, from around 2nd/3rd grade (US). Was curious enough to try and find a copy at the time, but since it was listed under 'Surreal 3000' in the reader, I never found a US publication copy. I remember this from elementary school, although I can't recall whether from the school book program or the library. And for some reason I have details in it mixed up in my mind with details from The Happy Planet, by Joan Clarke. I can confirm that bald people are highly advanced.